Figure 1 Fragment of the Nine Dragon Scroll, original currently in the collection of the Boston Museum of Fine Arts. In the year 1244 C.E., 35 years before the Chinese Southern Song dynasty (Chinese: 南宋, 1127–1279) was conquered by the Mongol army led by Kublai Khan, Chinese ink painter Chen Rong (陳容; pinyin: Chén Róng, ca. 1200–1266 C.E.) 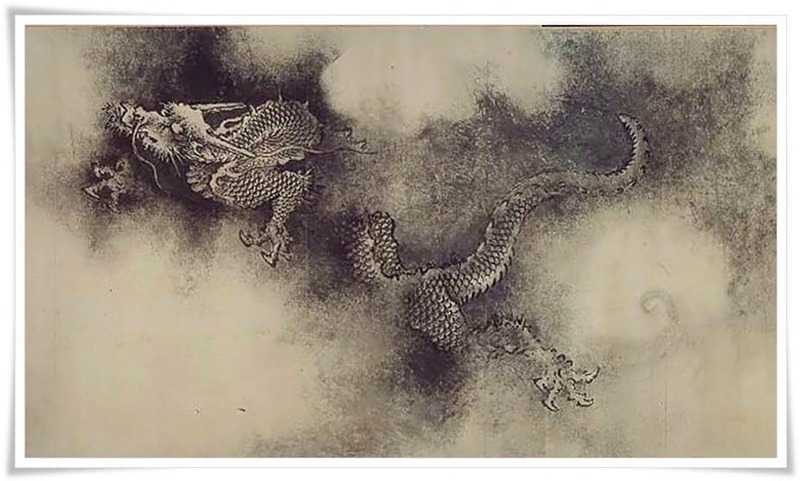 unleashed his frustrations with a political career onto a paper, and created possibly the most renowned Asian dragon ink painting – The Nine Dragons Scroll (九龍圖卷, pinyin: Jiǔ long tú juǎn). Chen Rong was a scholar and also a low level official official, though not a very successful one, from Fujian Province (福建省pinyin: Fújiàn shěng) in south-eastern coastal China. During his time, he was already recognised for his skill of painting dragons and bamboo. 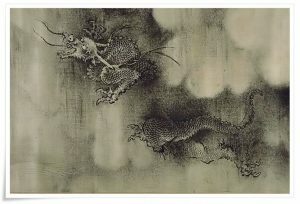 The inspiration to paint The Nine Dragons Scroll was spawned by the bitterness of his involvement in the political life. The medium were ink, paper, and … considerably large dose of wine, as he was completely intoxicated when painting it. Figure 2. Fragment of the Nine Dragon Scroll, original currently in the collection of the Boston Museum of Fine Arts. Digressing here, I must say that the analysis of the most outstanding calligraphy masterpieces leads me to a conclusion that one should consume wine along with using the ink. Whether it is Wang Xizhi (王羲之, pinyin: Wáng Xīzhī, 303 – 361) and his famous Preface to the Poems Composed at The Orchid Pavilion (蘭亭集序, pinyin: Lántíngjí Xù), Huai Su (懷素; pinyin: Huái Sù, 737–799 C.E.) and his Autobiography (自敘帖, pinyin: Jì xù tiē) or insane cursive script, known as kuang cao (狂草, Chinese: kuáng cǎo), of Zhang Xu (張旭, pinyin: Zhāng Xù, fl. 8th century C.E. ), it is always a combination of their uncanny personalities, outstanding skill, strong emotions and even stronger wine. Figure 3. Fragment of the Nine Dragon Scroll, original currently in the collection of the Boston Museum of Fine Arts. The quantity of dragons in the scroll is not a coincidence. “Nine” is a very auspicious number in Chinese astrology and ancient beliefs. It is somewhat a magical number. If you multiply 9 by any of the numbers from 1-9, and then add the numbers of the result to one another, you will always end up with 9. For instance: 5 x 9 = 45, and then 4 + 5 = 9, etc. I wrote quite extensively about this number in the article on the etymology of the character 九 (きゅう, kyū, i.e. “nine”). Figure 4. Fragment of the Nine Dragon Scroll, original currently in the collection of the Boston Museum of Fine Arts. Figure 5. Fragment of the Nine Dragon Scroll, original currently in the collection of the Boston Museum of Fine Arts. Bixi (贔屓, pinyin: Bìxì), the eldest son, who is often depicted as a dragon tortoise. The hard shell of the turtle represent resilience, toughness, also longevity and good fortune. Bi Xi can be often seen at the bottom of pillars and building foundations. Chiwen (螭吻, pinyin: Chīwěn), the second son, who is in control of the water element. He is often embedded in the rooftops designs, depicted with a mouth wide open, that seems to be devouring the edges of the roof. It is said that Chiwen protects households from fire. Pulao (蒲牢, pinyin: Púláo), the third son, a master of the mighty roar that warns people of nearing disturbances or disasters of various kind. It is not surprising that Pulao is often seen carved on temple bells, drums or other instruments that produce a loud sound. Bi’an (狴犴, pinyin: Bì Àn), the fourth son of the Dragon King, the guardian of justice and righteousness. He can be sometimes mistaken for a tiger, as his mouth seems to combine features of both, the dragon and the tiger. Courts and various justice related institutions often have his image carved over the entrances to remind all who enter of his watchful presence. Figure 6. Fragment of the Nine Dragon Scroll, original currently in the collection of the Boston Museum of Fine Arts. Taotie (饕餮, pinyin: Tāotiè), the fifth son, who, just like me, enjoys food. During Shang (商朝, pinyin: Shāng cháo, 1600 – 1046 B.C.) and Zhou Zhou dynasty (周朝, pinyin: Zhōu cháo, 1046 – 256 B.C.) dynasties he was often cast on ritual bronze vessels and tableware. Taotie is a guardian of wealth, wellbeing and all what is delicious. Gongfu (蚣蝮, pinyin: Gōngfù), the sixth son, a fantastic swimmer whose world is water. You will find his image on roof drains, bridges, ships. He is also in control of the floods, and his presence protects against them. Yazi (睚眦, pinyin: Yázì), the 7th son, the dragon god of battles and victory. You will find his powerful gaze staring at you from various blades or spear carvings, possibly even war banners. Presence of Yazi brings fear to the enemy forces and ensures the triumph in military conflicts. Figure 7. Fragment of the Nine Dragon Scroll, original currently in the collection of the Boston Museum of Fine Arts. Suan’ni (狻猊, pinyin: Suānní), the 8th son, who is often found near incense burners. Possibly every one of you has seen his image. He is depicted as a lion-shaped mouth dragon, sitting calmly and observing the surroundings. His body is covered with flames and usually painted gold. Suan’ni is believed to be the guardian of knowledge and dragon god of wisdom. According to the legend villagers sent a message to the Dragon King complaining about his son, who, according to them, was doing nothing all day long, except sitting and playing with fire. When the Dragon King arrived to see for himself what is going on, he noticed that his son was explaining to the children importance of the fire, and its eternal spirit. He then realised that his son is knowledgeable and responsible. Jiaotu (椒図, pinyin: Jiāotú), the ninth son, the guardian of the household. In another ancient legend the Dragon King tried to enter the house of his son Jiaotu, which task was extremely difficult. After a long time and many trials, he finally succeeded. Jiaotu is often seen on front doors protecting the house from burglars, etc. Figure 8. 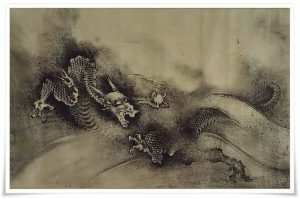 Fragment of the Nine Dragon Scroll, original currently in the collection of the Boston Museum of Fine Arts. The Nine Dragon Scroll by Chen Rong is haunting me from the first day I laid my eyes on it. It is absolutely mesmerising. It is a brilliant combination of various panting techniques, such as random splashes of ink, so characteristic for this particular artist, seamlessly combined with refined and surgically executed brush strokes (especially around the areas which depict rocks and cliffs). This masterpiece leaves me staring transfixed, drivelling like a child under a spell of Donald Duck’s wild adventures. 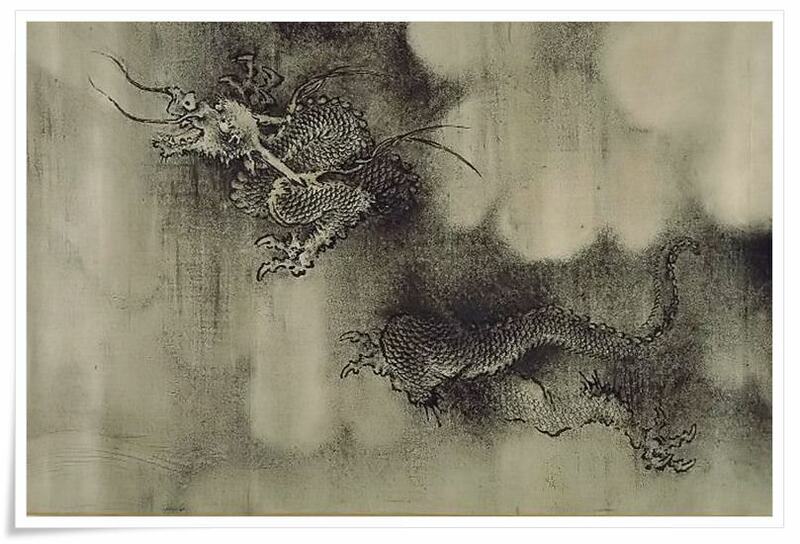 Chen Rong’s frustration with his life is so clearly seen in the ferocious images of the dragons. They appear and disappear into the fog of human illusion, just like it happens in real life. This painting is an astounding manifestation of ever-lasting movement of the world, and consequences of emotional chaos. 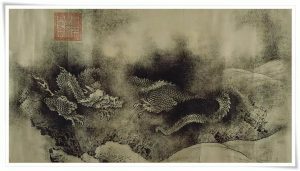 It is a combination of utter brilliance, strong feelings, outstanding calligraphy and ink painting skill, and a completely sloshed mind.